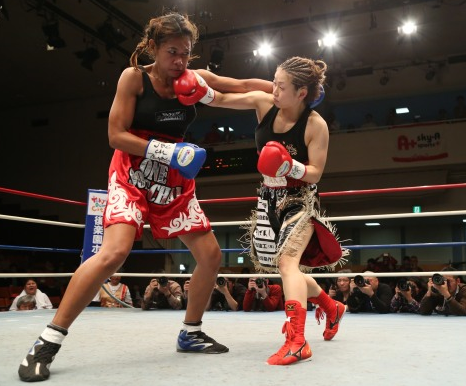 Whilst the dominant Momo Koseki recorded the 13th defense of her WBC Atomweight title her compatriot, and WBA Atomweight champion, Ayaka Miyao (17-5-1, 2) was also in fine form. Miyao, defending her title for the 4th time, faced Buangern Onesongchaigym (10-5-1, 1) and looked in control from the opening bell as the the Challenger failed to keep up with anything she did. Miyao, known for her impressive output, took control of the bout early with her speed and combinations putting Buangern on the back foot. Although the shots didn't have thunderous power in them they were coming from all angles with Miyao showing amazing movement as well as great work rate. The shots were simply too much for Buangern to cope with and the Thai was really unable to land much on the Japanese fighter. The skills of the champion was making the bout look thoroughly one sided and the challenger was looking completely helpless against the skills of Miyao. The only thing saving Buangern from serious harm was the fact Miyao doesn't have thunderous power in her hands. Despite the lack of power from the champion the shots were simply too frequent and too clean with every shot landing on the challenger. The accumulative effect of the shots were breaking down the challenger who was clearly out of her depth. The shots were taking their toll and in round 5 Buangern went down. She was a beaten fighter and although her heart wanted to continue she was unable to beat the count, probably a good thing in all honesty as Buangern was seriously taking a shellacking. Rather interestingly this was Miyao's first stoppage in 7 bouts and just the second in her career. Whilst we wouldn't suggest that Miyao is developing serious power she did seem to have genuine snap on her shots and they were hurting Buangern from the early stages. Whilst we know that Buangern isn't the toughest fighter and was stopped by Su-Yun Hong we didn't expect Miyao to stop her. This impressive performance from the WBA champion will lead to fans calling for the much wanted Miyao/Koseki unification bout. Sadly we believe that fight isn't on the agenda of either fighter, a real shame considering that it looks a natural match up from where we are sat. Japan's Naoko Shibata (12-3, 3) was long viewed as Japan's "nearly girl". She had come up perilously short in world title fights to Etsuko Tada and Ibeth Zamora Silva and many felt she was never going to win the big. Last year Shibata did manage to finally win a world title, the IBF Light Flyweight belt, by narrowly out pointing young Mexican Alondra Garcia though many did questioned whether or not she deserved the decision. It was as if some fans felt Shibata simply didn't deserve a close decision to go in her favour and that she didn't deserve a world title. It was a harsh view though one that a number of fans, for whatever reason, felt was fair. Earlier today Shibata defended her IBF title for the first time as she attempted to make a point of the title making her a better fighter. It seemed obvious that the belt was an honour for Shibata and it showed. Fighting against Mexico's Guadalupe Martinez (6-6, 3) things looked easy on paper though Martinez was an experienced fighter at the world level having twice previously challenged for world titles. 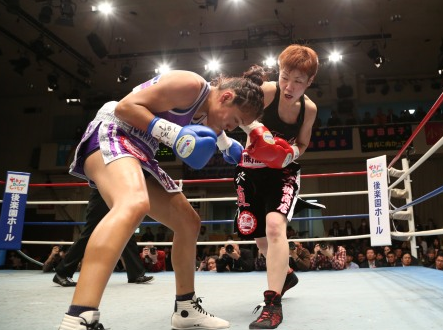 They proved to be easier than expected as Shibata got on her toes, and completely out boxed her challenger. From the opening round to the 10th round Shibata simply dominated the fight with her technical skills really impressing. Martinez, to her credit, refused to take the loss lying down though the #11 ranked challenger never managed to make much of an argument for more than a round or two at most as the technical skills of the champion really were too much for the challenger. 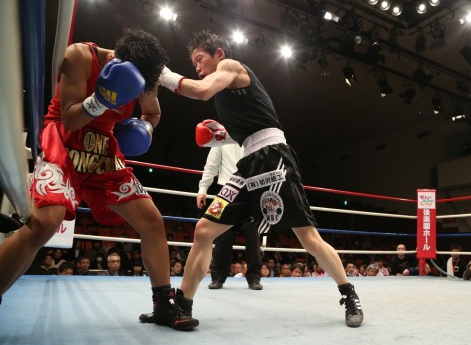 When it came to the score cards it was a formality Shibata had dominated and taken a clear victory with scorecards of 98-93, 98-92 and 99-91. It was clear as day that Shibata had become a fighter who believed she was world class and she showed it with this performance. Whilst it's obvious that Shibata wouldn't be the favourite to beat the divisional elite such as Yesica Yolanda Bopp or Jessica Chavez she has the ability and experience to give any other fighter in the division a very tough time. We dare suggest that she more defences she makes the more she'll believe in herself and improve. (This bout was part of the "G Legend 6" show).